Woohoo! I have finally found myself some tartan trousers! If you read my outfit inspiration post you will know that I have been looking for a pair of navy and green tartan trousers for a while with no luck! However, on my long overdue trip into Topshop the other day I found these beauts and they are perfect! I also ordered this 'Celine' (obviously not real) T-shirt from Ebay the other day for a bargain £7.49!! (Another item from my outfit inspiration wishlist!) It is perfect for this seasons monochrome trend and ideal for pairing with the tartan trousers to dress them down a bit. I have been searching all over for that top, can i be cheeky and ask where you got it? cute cute CUTE outfit, love it! I reeeaally want one of those tees, and I love me a pair of printed trousers :) Your hair is gorgeous as well, wish my hair could be as long and look so healthy! Love those trousers with that tee! 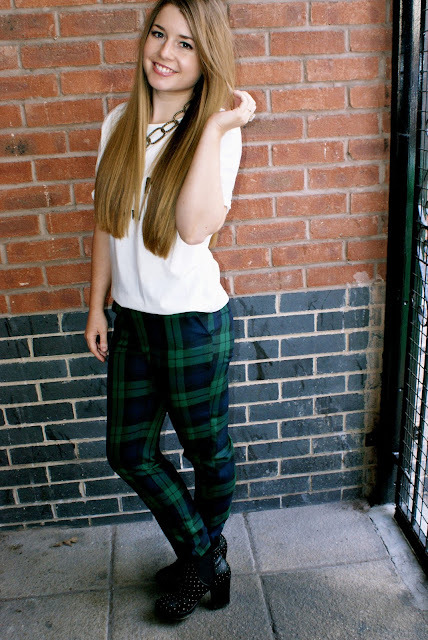 Tartan pants are on my wishlist toooo. Love the celine tshirt!! I like how it's super casual, but the brand name makes it chic! Gorgeous outfit. The top is great, I always see it on tumblr! 5 under. Spam and confidence schemes should be banned from the search engines. Penguin, on April 24, heads spun.